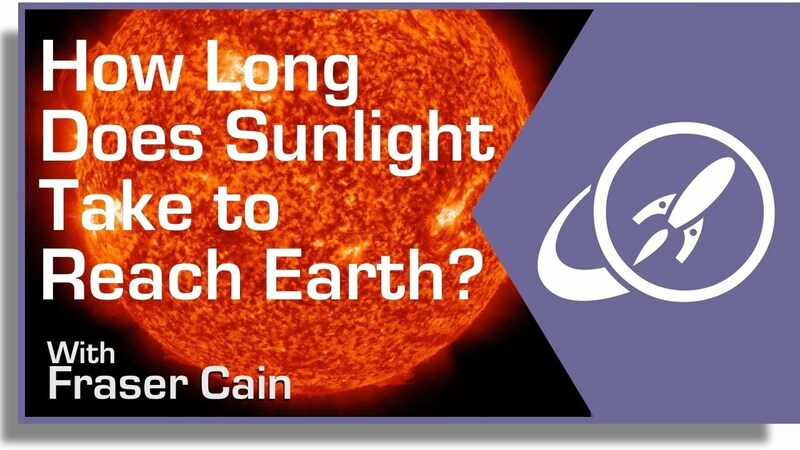 Here’s a question… how long does it take sunlight to reach Earth? This sounds like a strange question, but think about it. Sunlight travels at the speed of light. Photons emitted from the surface of the Sun need to travel across the vacuum of space to reach our eyes. The short answer is that it takes sunlight an average of 8 minutes and 20 seconds to travel from the Sun to the Earth. If the Sun suddenly disappeared from the Universe (not that this could actually happen, don’t panic), it would take a little more than 8 minutes before you realized it was time to put on a sweater. Here’s the math. We orbit the Sun at a distance of about 150 million km. Light moves at 300,000 kilometers/second. Divide these and you get 500 seconds, or 8 minutes and 20 seconds. This is an average number. Remember, the Earth follows an elliptical orbit around the Sun, ranging from 147 million to 152 million km. At its closest point, sunlight only takes 490 seconds to reach Earth. And then at the most distant point, it takes 507 seconds for sunlight to make the journey. But the story of light gets even more interesting, when you think about the journey light needs to make inside the Sun. You probably know that photons are created by fusion reactions inside the Sun’s core. They start off as gamma radiation and then are emitted and absorbed countless times in the Sun’s radiative zone, wandering around inside the massive star before they finally reach the surface. What you probably don’t know, is that these photons striking your eyeballs were ACTUALLY created tens of thousands of years ago and it took that long for them to be emitted by the sun. As you look outward into space, you’re actually looking backwards in time. The light you see from your computer is nanoseconds old. The light reflected from the surface of the Moon takes only a second to reach Earth. The Sun is more than 8 light-minutes away. And so, if the light from the nearest star (Alpha Centauri) takes more than 4 years to reach us, we’re seeing that star 4 years in the past. There are galaxies millions of light-years away, which means the light we’re seeing left the surface of those stars millions of years ago. For example, the galaxy M109 is located about 83.5 million light-years away. We have written many articles about the Sun for Universe Today. Here’s an article about the color of the Sun, and here are some interesting facts about the Sun.